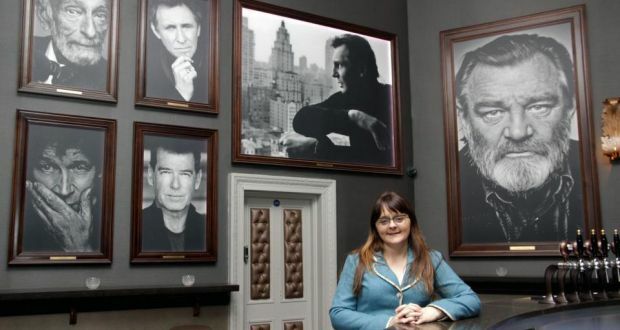 Divine Design managing director Gwen Kenny in the Portrait Bar at the Olympia Theatre in Dublin. Divine Design is a Dublin-based interior design company which employs nine people and which creates bespoke interiors for both commercial and residential clients. The company works with the client from the beginning of the design process right through to turn-key completion. Divine Design was established 13 years ago by Gwen Kenny. Our business is divided 50/50 between members of the design team and our own team of skilled craftspeople. Having the two skill sets on one team lends itself to being innovative in our designs. We project manage each project from beginning to end, so it gives us full control of the process. I worked in Grafton Group for three years before I set up my business and that gave me a huge insight into how to problem solve on the supply side of things. The other single biggest piece of advice I’ve ever received was to “Keep an eye on cash flow” – something that has really kept the business going for the past 13 years. Probably putting too much of myself into projects. I regularly lie awake at night pondering on things such as how to hang a half-tonne chandelier within three millimetres of a particular spot. My perfectionism comes at a cost to me and my family. I really need to take time off and relax a bit. When you work for yourself you tend to work this way because you never know where your next job is coming from. The last 12 months in business have been my most successful. I have worked on a number of projects including the Alchemy Room at Teeling’s Whiskey, the complete refurbishment of the four bars of the Olympia Theatre and Andrew Rudd’s Medley. It’s been a hugely successful year for us. I really admire Caroline Downey for both her business and charitable acumen. She is the co-owner of MCD Promotions, of the Gaiety and Olympia theatres and she manages Hozier. Aside from that, she is president of the ISPCC and of Childline, is on the board of the Christina Noble Children’s Foundation and has raised tens of millions for charity. Despite how busy she is, she is able to recall in minute detail the last conversation she had with you and has huge time for everybody. She takes multitasking to a whole new level. We grew our business during the recession and had nothing but support from them so I would have to say yes. Obviously we’ve had to jump through hoops but anything we have asked for we’ve got. Treat people who start their own small businesses the same way as they treat directors of limited companies with regards to allowances. Self-employed people seem to get the short end of the stick from every direction. The biggest challenge personally has been in the past 12 months. Despite it being my most successful year in business, it has been challenging as I’m studying for a master’s degree, working 12 hours a day and being a mum to two kids..
On a professional level, although we grew the business during the recession the funny thing was that word-of-mouth recommendations, particularly on the residential side, completely dried up because people didn’t want anyone to know they were spending money. It took me ages to figure out what was going on but I realised it on the day I was introduced as “the curtain lady” – people were ashamed to be seen to be spending money on interiors. Commercial work slowed down at that time but the fact that we work on both commercial and residential projects buffered us against the recession. I would like to grow the business a small bit more but keep the size in check so that it remains personal. I would also like to pursue sustainable and green design. I think that, as interior designers, we have the power to shape the industry by specifying things that are good for the environment. I’ve learned that my business is worth what the market is willing to pay for it. I probably wouldn’t sell it – it is like a third child to me. I get up every morning at 6.30 to work on the business before I go into the office because I eat, sleep and breathe the business and will continue to do so.